Frank Bateman was a robust follower-forward from Leongatha who experienced the thrill of playing in the 1949 Grand Final for Carlton in just his fifth senior match. He showed enough promise to be urged to continue, but his form tailed off in his second season, and his career petered out after just over a year of VFL football. Bateman got his first opportunity at senior level in round 17, 1949, when the Blues travelled to Geelong to take on the Cats at Kardinia Park in a crunch game. Carlton was entrenched in third place on the ladder, while Geelong were sixth – but still very much in contention. The absence through injury of Carlton’s front-line tap ruckmen; ‘Chooka’ Howell and Ken Hands, created the opportunity for a couple of lesser lights in Bateman and Bernie Baxter to show their wares, and both contributed in a slashing 43-point win by the Blues. Bateman stood up under real physical pressure, while Bernie and his brother Ken went on a goal-kicking rampage, ending up with nine majors between them. Bernie drifted across from the pocket and sent through a good goal, while Ken marked everything that came his way and kicked the other eight! It was Frank’s turn to get among the goals the following week, when he booted the first two majors of his career in a 21-point victory over St Kilda at Princes Park. On the same day, Ken Hands returned to the team, joining with Bateman and Herb Turner in a first ruck combination that would lead the Blues into battle throughout our finals campaign. Although a shock loss to North Melbourne at Arden Street wasn’t the ideal way to finish off the 1949 home and away season, Carlton struck back and knocked over the Shinboners in the second Semi Final. That meant that, after only four senior games for the Blues, Bateman was in line to play his next match in a VFL Grand Final against Essendon. The only question was; would Carlton’s selectors keep him in the team now that Howell and Hands were fit again? The answer was yes. Frank’s dream came true after the following Thursday night’s hectic training session at Princes Park when he was told that he had retained his place alongside Hands in the ruck, allowing ‘Chooka’ Howell to go to centre half-forward. Sadly, all those preparations came to nothing on Grand Final day. In front of 90,000 spectators at the MCG, Essendon thrashed Carlton by 73 points in a one-sided affair – highlighted by the duel between Essendon’s blossoming champion full-forward John Coleman, and Carlton’s great full-back Ollie Grieve. Coleman kicked the six goals he needed to take his season’s tally to 100, but few who were there would agree that he got the better of Grieve in a classic football duel. In his second year, Bateman got off to a slow start when he sat on the reserve bench as 20th man in Carlton’s first two games. He then kicked four goals from a forward pocket when Carlton beat Richmond by 11 points in round 4 at Princes Park. Next, he was tried in a number of other positions - including full-forward – without fully grasping his chances, and by late in the season he was back in a dressing gown on the wrong side of the boundary line. Although he didn’t know it at the time, Frank appeared in his last senior match for Carlton as 19th man against Footscray the Western Oval in round 17, 1950. On a typically cold and windy day, the Bulldogs used their home-ground advantage well, and beat the Blues by 13 points. 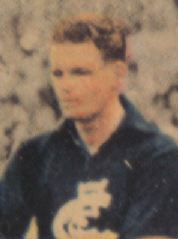 Bateman was then left out of the team for the last game of the season, before fronting up again at Princes Park in 1951. Frank never did manage to break back into the seniors after that, but at least he represented the Reserves for much of the year, and gained some small revenge when Carlton beat Essendon in a hard-fought 1951 Reserves Premiership. Wearing guernsey number 38, Bateman occupied the bench as 20th man yet again on that satisfying afternoon, when the Blues’ Twos toppled the Bombers’ Reserves by 12 points. Bateman's last season at the Blues was in 1952, he headed off to VFA Club Preston the following season. Contributors to this page: Jarusa , Bombasheldon , molsey , pblue , PatsFitztrick , tmd1 , p(12)terg , dgreen2 , keogh , true_blue24 , Juzz and admin . Page last modified on Tuesday 16 of May, 2017 22:52:52 AEST by Jarusa. Stephen Kernahan in an International Rules game.